You've found your way to United Brokers. Thanks for visiting. Steve Toop, President of United Brokers and a licensed broker for over 35 years, has made Real Estate Investment, Accounting & Financial Services a full time profession since 1980. He offers unsurpassed knowledge and experience in Residential, Commercial, Investment Real Estate and Construction. 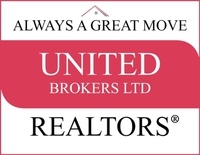 United Brokers offers a Flat Fee MLS Listing Service. Now you can list your property in the Realtors® MLS for a Fixed Flat Fee and pay NO Listing Commission. We are Realtors®, not a referral company. There are dozens, if not hundreds, of Flat Fee Listing services on the internet today. Many are referral companies, not Realtors® or actual members of the MLS. We are members of the National Association of Realtors®, the North Carolina Association of Realtors® and the MLS. Onslow and parts of Pender, Carteret and Jones. Avery, Buncombe, Burke, Haywood, Henderson, Jackson, Macon, Madison, McDowell, Mitchell, Polk, Rutherford, Swain, Transylvania, Watauga, Yancey. Check for small MLS's by county. You'll learn more about us and our unique way of doing business and the Flat Fee MLS concept. You'll learn how we have saved buyers and sellers thousands of dollars and how we can do the same for you. Check out the customer testimonials and research Real Estate sales statistics. For Example: Agents rarely sell their own listings! Did you know that nearly 9 out of every 10 homes sold are sold through the Multiple Listing Service (MLS) and Cooperating Brokers/Buyers Agent; that an NAR (National Assoc. Of Realtors®) survey indicated that 85% of home buyers surveyed used an agent; that over 80% of all buyers used the Internet when searching for property; when asked where they first heard about the home they purchased only 5% identified a print or newspaper ad while a mere 1% indicated a home book or magazine. Throughout the site you'll find useful information about real estate, designed to help you through the process of buying and selling. Get great tips for homeowners and for future homeowners. Check the prevailing interest rates and find mortgage information. Get the latest real estate news and search for homes and property. Automatically receive personalized MLS listings by e-mail. We set up an automated MLS search that finds the homes that match your criteria and notifies you immediately with the latest listing information!! Simply choose Personal MLS Window and fill in the requested information. Or, search for yourself at Search The MLS. When you find the perfect property your United Brokers agent will work extra hard to skillfully negotiate the lowest possible price and the most favorable terms.